When all the lifts are closed and it has just snowed 50cm yet rained to 3000m and had gale force winds above, options become a bit limited for mountaineering or skiing! 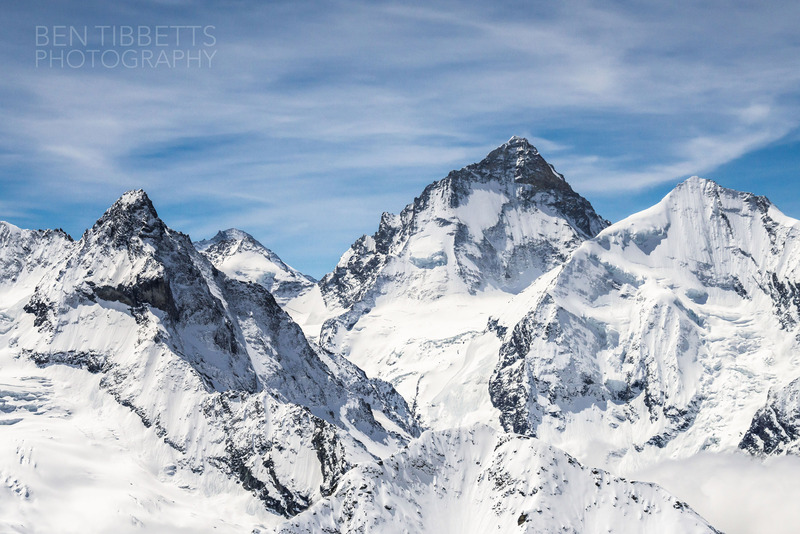 As I’m working on a photography book of the finest routes on each of the 4000s, it seemed an ideal time to have a first look up the Bishorn (4153m) above Zinal in Switzerland. 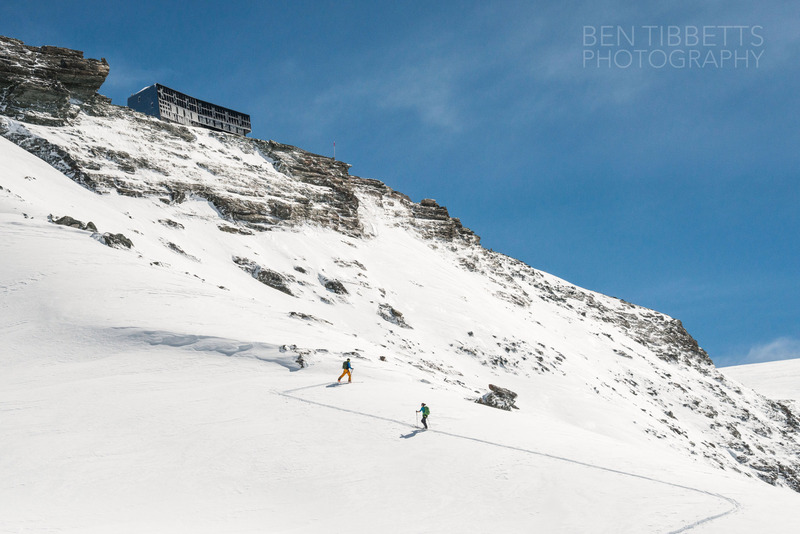 Though there are definitely more exciting peaks, it looked like a good day out. The weather window looked tight… about 8 hours between storms, and it was still raining as we drove up to Zinal! Tom putting his boots on after a 500m hike. 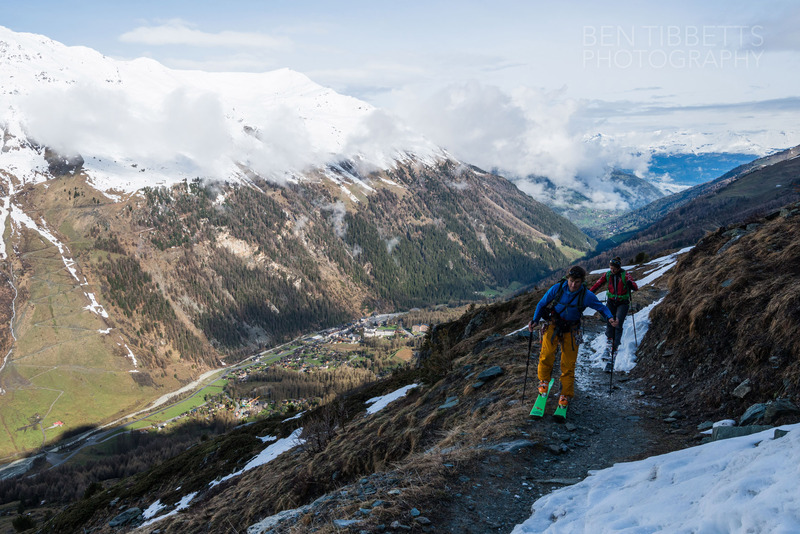 The snowline at the moment is about 2300m which meant we could just about get up the summer path straight from Zinal. We hiked in trainers and left them at the snowline. On descent this steep finale on wet snow wasn’t great so in winter and spring if you can see snow from the valley on the summer path slopes to the north of Roc de la Vache the longer route via Le Chiesso further up the Zinal valley is much more secure. 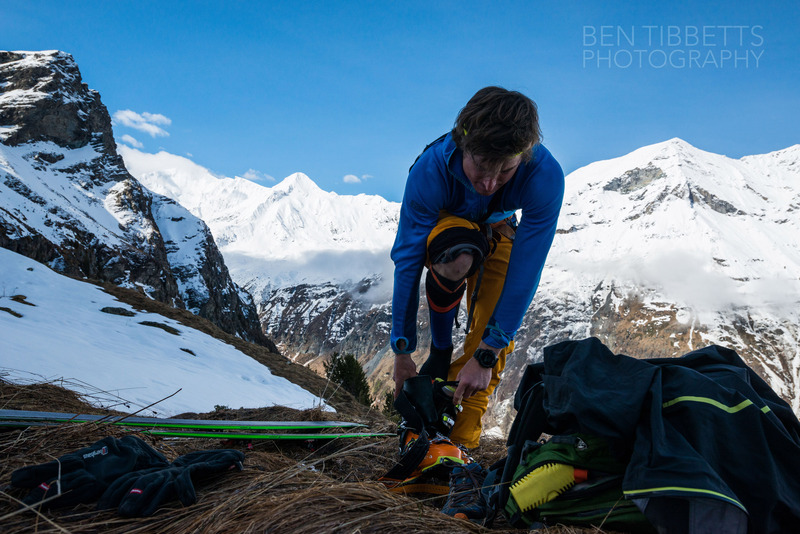 A little bit of dry skinning between snow patches! Fresh snow + mellow terrain! 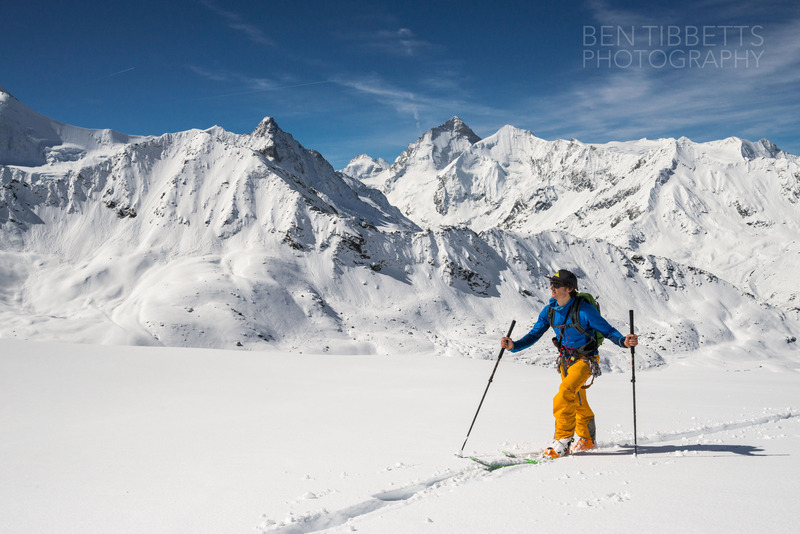 Though the route can be done all year round, spring approach on skis is probably the ideal time. In spring the crevassed glacier is best filled in, and the descent back to the car will take 1/4 of the time it would on foot! 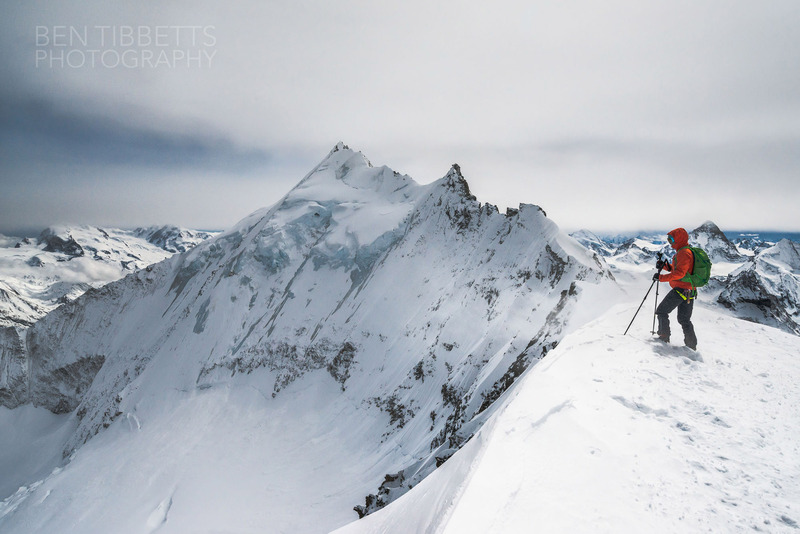 If one chooses the longer approach, and chooses ones line carefully you can stick to sub 30º slopes almost all the way from the car to the summit. The only section where one is obliged to move up some >30º terrain, i.e. places it could potentially release an avalanche, are just below the hut (above). However one can navigate this section by the blunt ridge, which is windswept and often accumulates less snow, below the Col de Tracuit (3250m). From here chains aid a short passage though a rock step to behind the hut. 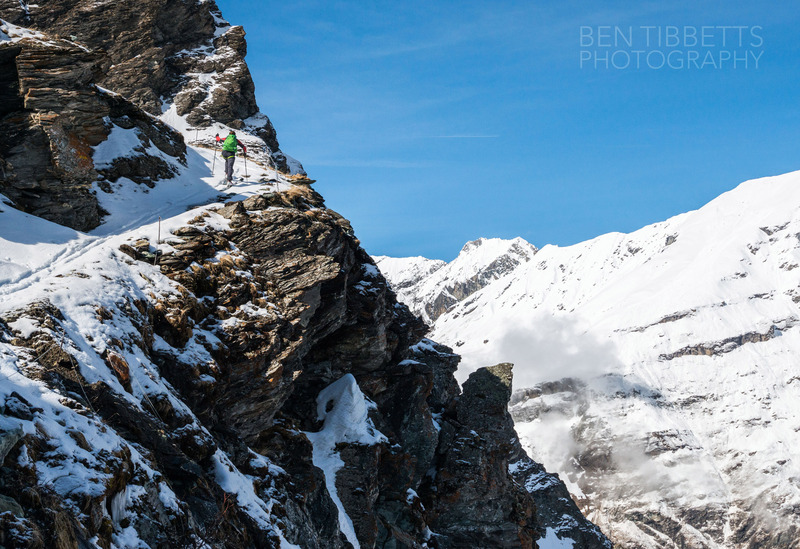 For the duration of the ascent the views are superb as the heart of the upper Valais is revealed as one gains height. 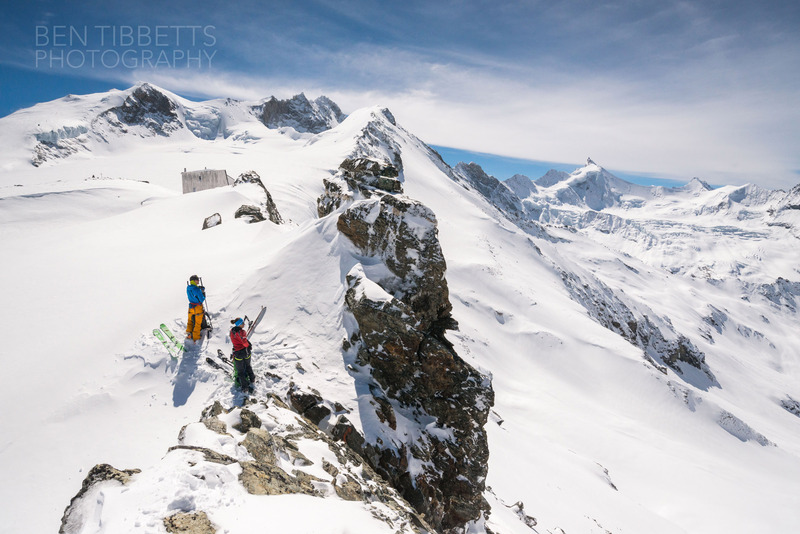 As terrain is very simple this is a great peak with a novice party, or in conditions of unsettled snow. 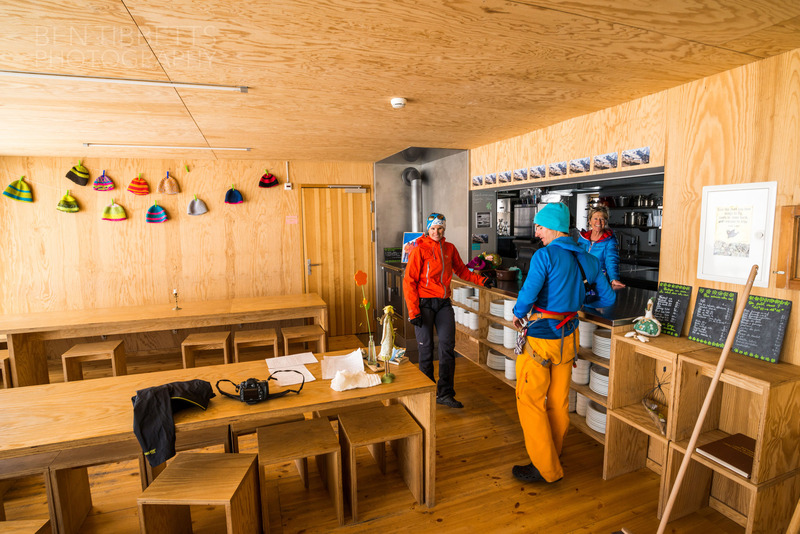 The climb can be broken with an overnight in the Cabane de Tracuit which has been recently rebuilt and like many Swiss huts, has a striking design. 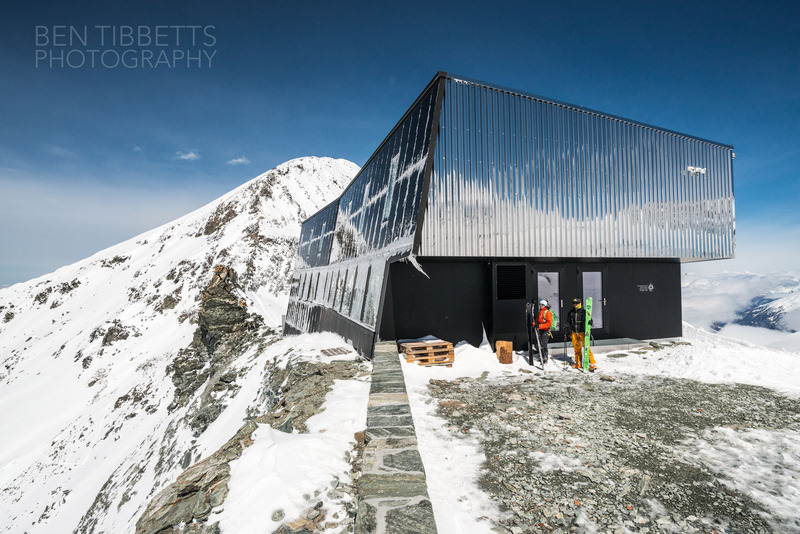 This is the highest hut in Valais with a non glacial approach, and is great objective on its own, affording outstanding views from the dining room across to the Zinalrothorn, Obergabelhorn and Dentblanche, and behind to the distance to peaks of the Bernese Oberland. 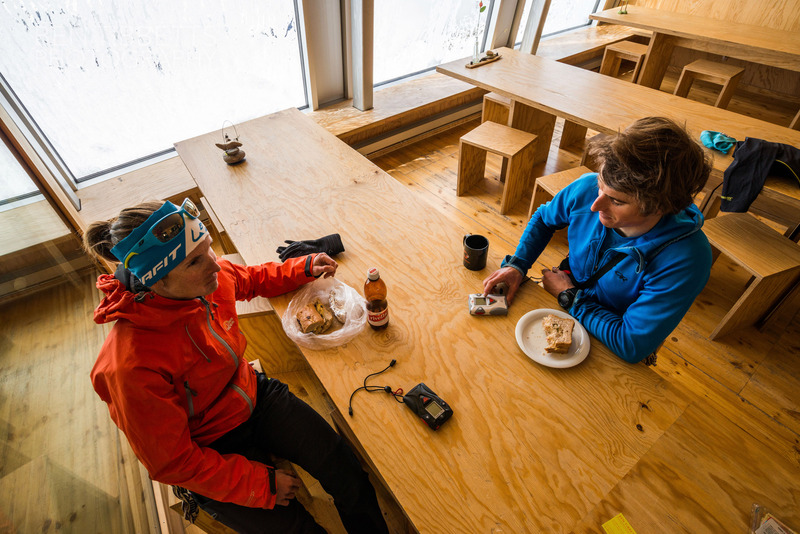 We were the very last party to visit this year before they closed the hut (winter room always open)… 80 people had booked in overnight that weekend but no-one had turned up as most of the weather was atrocious and most people want two good days to make the ascent. From the Cabane de Tracuit to the summit one is hardly aware of shape of the mountain, as the broad Turtmann glacier obscures much of the views to the north on the ascent. 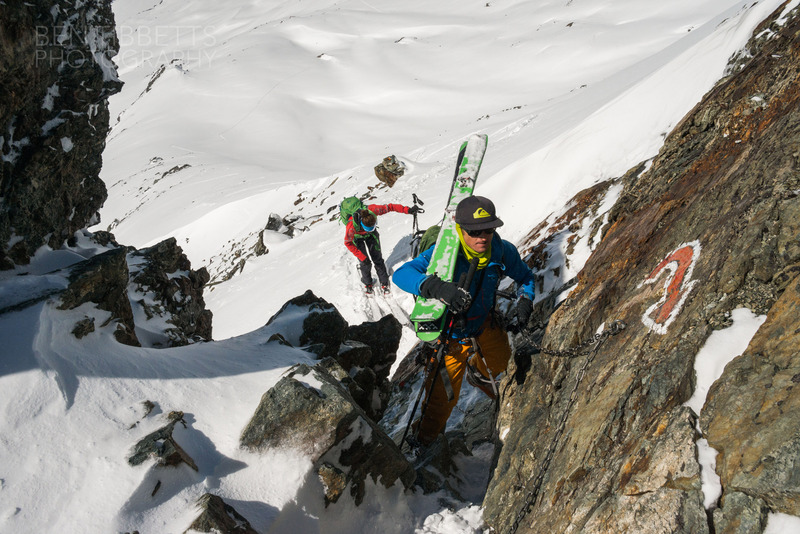 To its detractors, who probably aren’t on skis, this route is a purgatorial slog to the last lump on the north ridge of the Weisshorn! 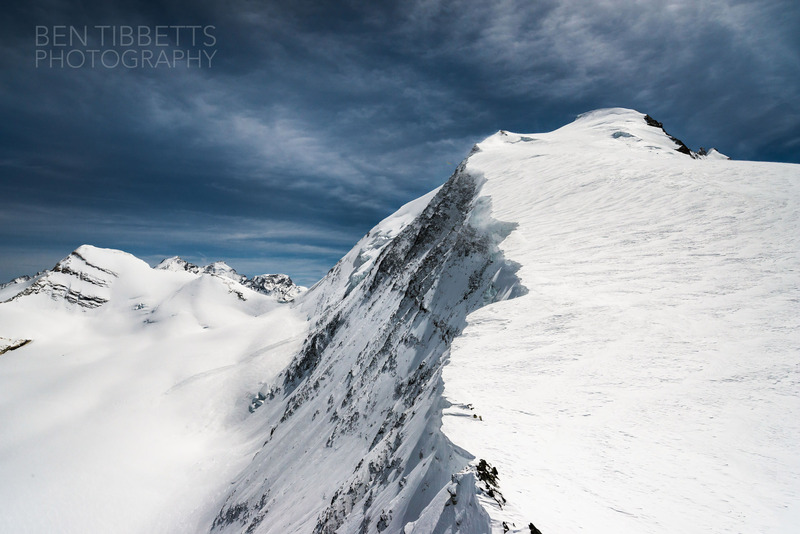 However from certain angles it is quite shapely, the NE face (above) being quite beautiful, if largely unclimbable due to cornices, seracs and loose rock! From the summit the views are excellent and one is quite grateful occasionally for such an amenable route to such an outstanding viewpoint. 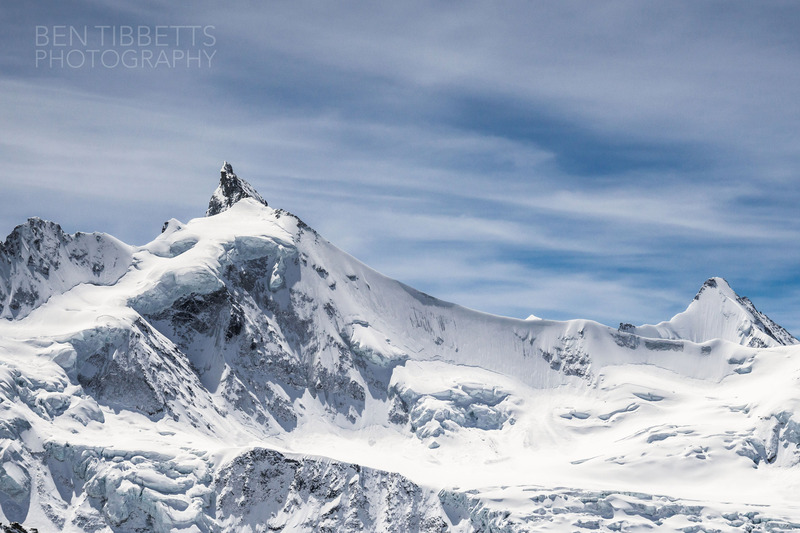 The summit scramble in great conditions… this would be often be icy in summer! 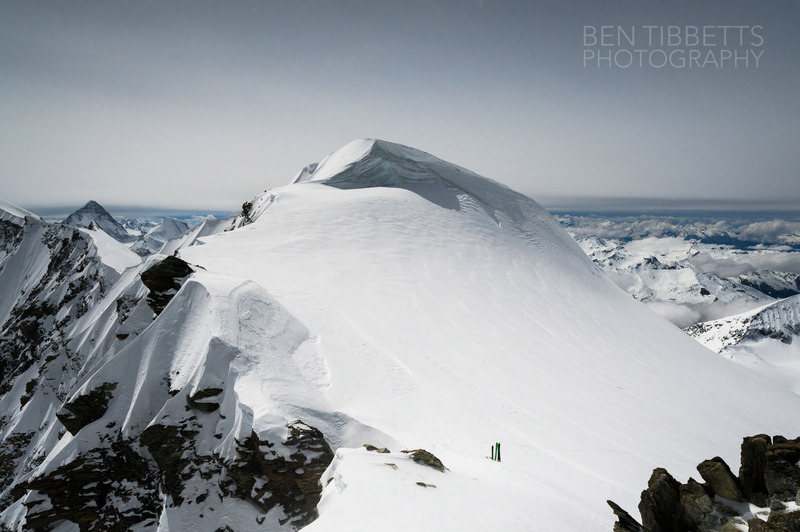 Valentine on the summit with the Weisshorn behind. As we reached the summit (Tom and Valentine way ahead of me as I had been distracted taking photos!) the weather was already closing back in. 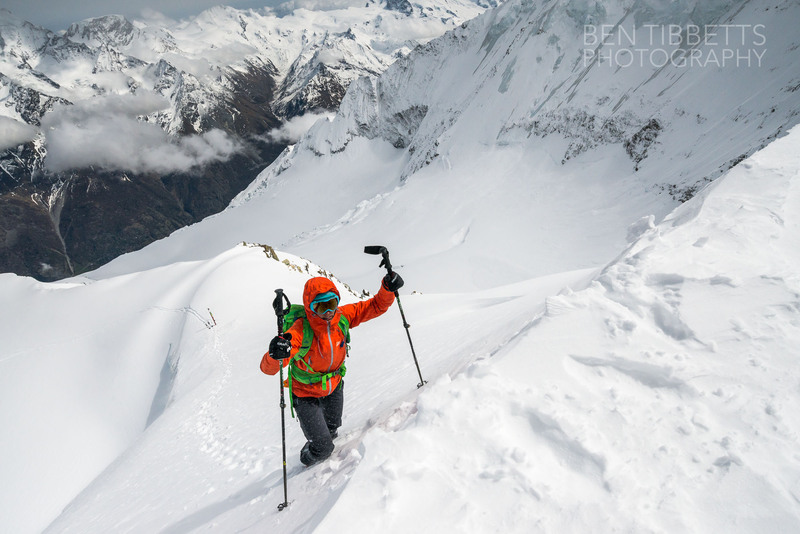 The long low front of clouds that had been creeping in from the west finally shut out the sun, the wind picked up further and on the descent we were enveloped by clouds and had to use our ascent tracks to retrace our route. Before we reached our trainers back on the path it was raining lightly. It felt great to have seized such a cheeky weather window and we were lucky to get back to the car moist rather than soaked as soon enough the heavens opened and it was time to get home. Thanks Tom and Valentine for yet another great day out!